Eight indigenous MedTech specialist companies have formed an innovative business cluster to promote Ireland as a global centre of excellence for the industry. The Atlantic MedTech Cluster is one of the first collaborative groups set up under Enterprise Ireland’s Clustering Programme. The cluster has been launched in Sligo by Minister for Business, Enterprise and Innovation, Heather Humphreys TD. 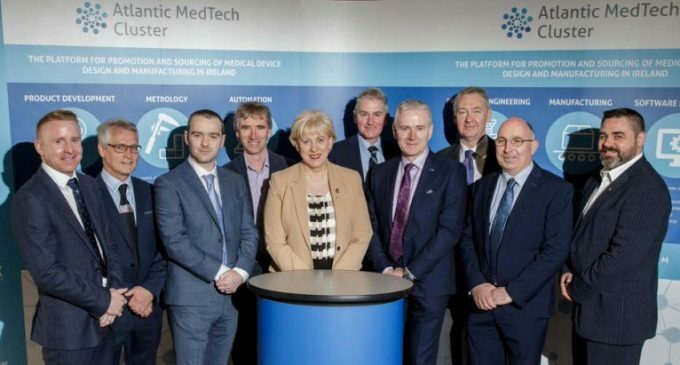 The Atlantic MedTech Cluster is a collaborative business organisation, which has created a platform for the promotion and sourcing of medical device design and manufacturing in Ireland. It allows potential clients to easily access multiple leading MedTech service providers in Ireland, bringing companies with years of experience to one location. It also allows clients the option of cluster members collaborating on projects which would streamline project management, resources and delivery. Combined, the companies have annual revenue of €33 million and employ 287 people in the region. They serve 282 customers between them – with 17 of the top 20 worldwide Medtech companies among their clients. (More details on each company are below). Pictured with Minister Heather Humphreys TD (centre) are (l-r): Keith Moran, SL Controls; John Ward, Ward Automation; Mark Pugh, Arrotek; Kevin O’Callaghan, Pharma Stainless; Dominic Finlay, ATS; Brendan Duggan, iNBLEX Plastics; John Shiel, Enterprise Ireland; Gerry Rafter, Tool & Gauge; Andrew Hodson, Verus Precision.